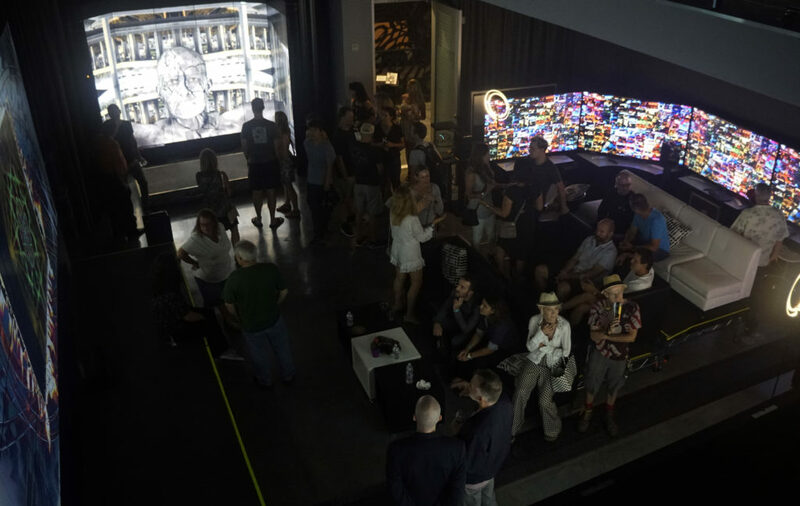 Thursday night saw the opening exhibition of “3 by 3” the second public offering at Virtularium as part of the El Segundo Art Walk on August 16. I created a brand new multimedia performance video art piece especially designed for an 18 screen curved video wall that was 9,720 pixels wide by 3,840 tall – a most unusual arrangement, but one that allows for a truly interesting immersive experience for viewers to step into and almost feel like they are on a ride. I had the experience of setting up the digital display for a commercial installation at the 2016 Mobile World Congress in Barcelona, so it was a pleasure to design something of pure artistic merit and of my own imagination. The reaction of the hundreds of El Segundo Art Walk participants couldn’t have been any better. I saw a lot of people taking out their phones to record my video installation along with the entire dazzling array of works in the Virtularium environment. Also on display were two works including the new piece “Untitled #9, Part 2” by Virtularium founder and director of programming, Jon 9 and a piece called “Travelers” by my collaborative art partner, Vojislav Radovanovic (who also did the excellent body paint job to turn me into a concrete saint/deity). LA is known for movies, sunshine, beaches, and lots and lots of traffic. After spending endless hours on the freeways commuting, I was given little choice but to find a sense of beauty in the massive megalithic structures of certain interchanges, in particular by the intersection of the 110 and 105 (which also inspired the opening dance number of “LA LA Land”). The grand columns and swooping ramps reminded me of a gothic cathedral, albeit one that honors the busy bustling metropolis and massive population growth it represents. 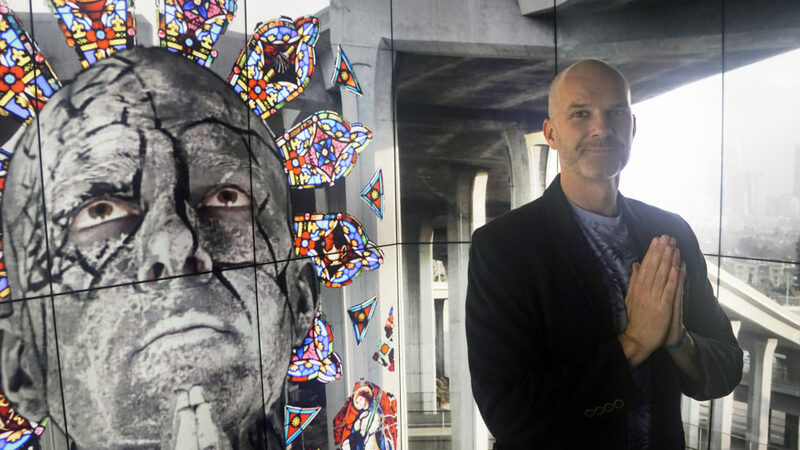 The concept has gestated for years, but now, with the 18 screen-videowall structure at Virtularium and its complex arrangement of screens and curves that offer different playing spaces, I designed the piece as such so that the Cathedral of the Freeways at last receives a vision of its concrete deity and a variety of stained glass windows to populate it.